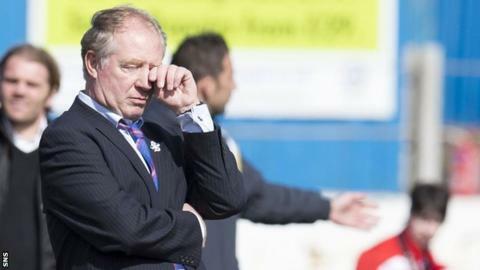 Jimmy Nicholl has resigned as Cowdenbeath manager after relegation from the Scottish Championship. The 59-year-old Northern Irishman's side were leapfrogged by both Livingston and Alloa Athletic on the final day of the season. Cowdenbeath finished bottom after a 3-0 defeat away to the Wasps. Chairman Donald Findlay said: "It is with regret that I have today accepted the resignation of Jimmy Nicholl as manager of Cowdenbeath." Nicholl, who had previously managed Raith Rovers and Millwall as well as having caretaker spells with Dunfermline Athletic and Hibernian, was in his second spell as manager at Central Park. The former Manchester United, Rangers, West Brom and Northern Ireland defender had returned to Cowdenbeath in 2013. His side avoided relegation last season after a play-off against Fife rivals Dunfermline. "I thank Jimmy for all his efforts on behalf of the club," added Findlay. "It had been a privilege working with him. We remain friends and I wish him and his family all the best for the future."